As with the construction of an anatomical image, discussed in this blog post, constructing a diagrammatic image in Illustrator relies on the appropriate use of layers. 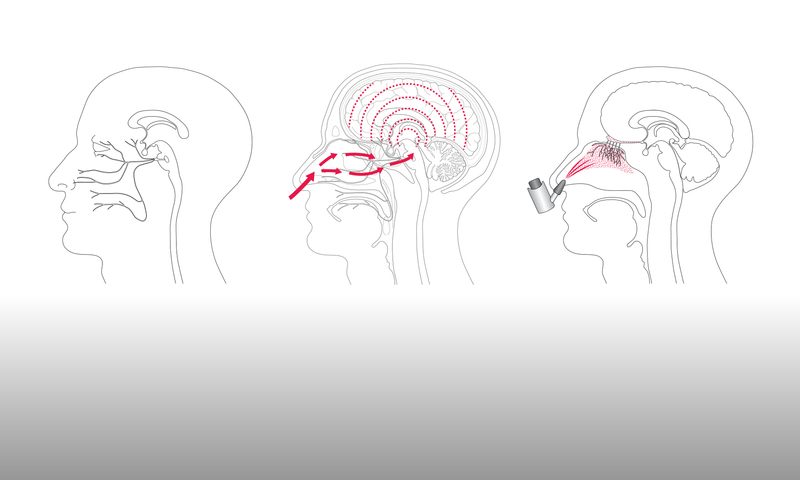 As before, we can start with a reference image, in this case a diagram representing olfactory nerves, shown below left. The final re-drawn Illustrator image is shown below right. The figure can be divided up into different visual elements, each of which is then drawn on a separate layer in Illustrator, as shown below. Arranging the layers sequentially, in the appropriate order, results in the final image, as shown below. It is a good idea to keep annotation and text on their own separate layers, and these will almost always sit at the front of the image. If a single layer contains several individual elements, then these can be ordered within the layer by moving them towards the front or to the back, to give the desired appearance. However, there may be instances where the ordering of elements is a little more complex. In the example figure, the red hoop that represents the olfactory tract lies both behind and in front of some of the green neurons. To achieve this appearance, we can insert an extra layer, in front of the layers containing the green neurons and the red hoop. This extra layer contains a segment of the red hoop, which sits on top of the original hoop and also covers two of the neurons. This then gives the impression that these neurons are passing through the hoop, as shown below. One advantage of drawing a diagrammatic image, as opposed to an anatomical image, is that many of the visual elements are relatively simple geometric shapes, which can be easily copied and pasted to create groups of elements, such as the receptor neurons shown below. Note that the rectangles that represent the cribriform plate are also identical, but the copies have been reflected and/or rotated to make them appear different. This is a quick and easy way to bring some ‘anatomical variation’ into a diagrammatic image.